As a sign of an improving economy, the nation’s nonresidential construction spending rose 0.7 percent in February, according to the April 1 construction spending report by the U.S. Commerce Department. Total nonresidential construction spending presently stands at $575.6 billion on a seasonally adjusted annualized basis, and is up 2.6 percent from one year ago. In February, private nonresidential construction spending rose 0.4 percent on a monthly basis and 6.1 percent on a year-over-year basis. 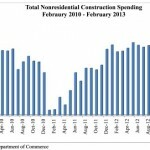 In a bit of a surprise, public nonresidential construction spending expanded 1.1 percent on a monthly basis in February, but was still 1.2 percent lower from the same time last year. Of the sixteen nonresidential construction sectors, eleven posted increases during the month of February. These included lodging, up 4.2 percent; highway and street, up 3.5 percent; health care, up 1.9 percent; conservation and development, up 1.3 percent; and power, up 1 percent. Six other sectors registered less than a 1 percent increase on a monthly basis. Nine sectors have registered a positive year-over-year increase in construction spending, including transportation, up 18.3 percent; lodging, up 16 percent; and office, up 10.5 percent. In contrast, five construction sectors experienced diminished spending in February on a monthly basis, including communications, down 9.1 percent; amusement and recreation, down 2.2 percent; religious, down 0.9 percent; sewage and waste disposal, down 0.4 percent; and office, down 0.2 percent. Large year-over-year declines in spending have been registered in public safety, down 13.1 percent; sewage and waste disposal, down 12.7 percent; and amusement and recreation, down 10 percent. Residential construction spending grew 2 percent in February on a monthly basis and was up 19.2 percent compared to the same time last year. 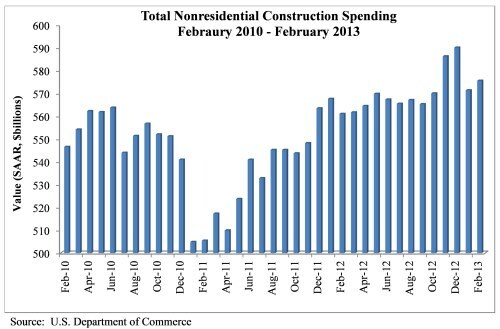 Overall, total construction spending–which encompasses both nonresidential and residential spending–rose by 1.2 percent for the month and is 7.9 percent higher compared to February 2012. “The U.S. economy continues to outperform expectations and this is gradually translating into improved performance in nonresidential construction,” said Associated Builders and Contractors Chief Economist Anirban Basu. “While the nonresidential construction industry’s recovery cannot be characterized as brisk, there continues to be forward momentum in a number of key private segments, including lodging and power,” remarked Basu. “If the nation is able to continue to add jobs as it has in recent months, office and commercial segments should also experience improved performance. “February was unusual in a number of ways, but perhaps the most interesting was the increase in public nonresidential construction,” remarked Basu. “This is a segment that has been slumping for an extended period, and the expectation has been that public nonresidential construction would continue to struggle to acquire momentum due to the impact of the automatic sequestration. However, the impacts of sequestration largely remain in front of us. “Meanwhile, consumers have received additional support in the form of rallying financial markets and large dividend payments at the end of 2012,” Basu stated. “Should financial markets reverse course, the positive wealth effects that have spurred consumer spending will dissipate, and so will the momentum of the broader economy. “For now, both financial markets and the U.S. economy continue to hold up, helping to restore spending momentum in the U.S. nonresidential construction industry,” said Basu.